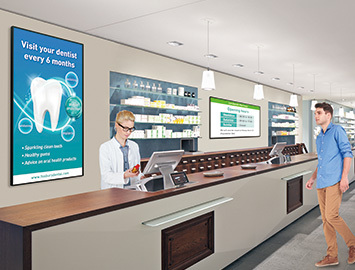 Sharp offers an effective and convenient solution for digital signage. Our PN-Y556/Y496/Y436/Y326 LCD monitors are designed for ease of use and flexibility in a variety of settings. Simple and stylish, they have the functionality to support easy content distribution. Whether in a retail, public, or office setting, these monitors can help convey your message and make an eye-catching impression. So if you're seeking a multifaceted signage solution with round-the-clock reliability and easy content distribution, these affordable slimline monitors offer outstanding value. Full HD (1,920 × 1,080) resolution brings images to life with vivid, true-to-life details. Everything from thin lines to fine text to photographic images can be displayed in stunning clarity. A narrow 9.5-mm* bezel keeps the emphasis on onscreen content, so that information is conveyed clearly and attractively. The simple and stylish design matches a variety of locations and business settings, from small shops to large corporations and industrial environments. 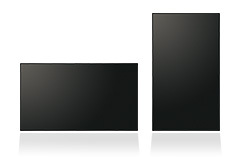 PN-Y556/Y496/Y436/Y326 LCD monitors support easy daily usage and versatile content distribution. Simply insert a USB memory device or SD card for plug-and-play operation. Using a specified wireless SD card equipped with an original Sharp HTML application, you can distribute content wirelessly from a PC or mobile device. Furthermore, SHARP Content Distributor software supports convenient content distribution and management via network. 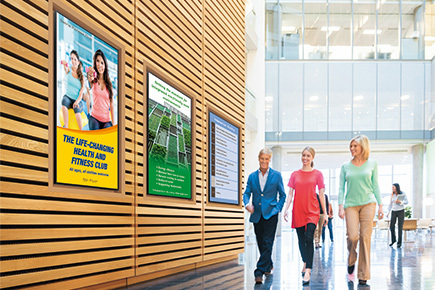 Thanks to their versatile signage capabilities, these monitors make it easy to convey messages in public spaces or commercial locations, or promote internal communication in the office. Displaying still images or videos couldn’t be easier. Just insert a USB memory device or SD card into the LCD monitor and the built-in media player starts playing your content right away. There’s no need for a PC and cables. It’s easy for anyone to operate. Note: A USB memory device and an SD card should not be used simultaneously. Supported media formats: JPEG and PNG for still images; MP4, WMV, and TS for videos; and MP3 and WMA for audio. JPEG (.jpg) and WMV (.wmv) files can be played automatically. With a specified wireless SD card*, you can wirelessly overwrite the content stored on the card. Using a wireless LAN makes it easy to distribute content from a PC, tablet or other mobile device, giving you a convenient data-transmission experience. There’s no need to insert or remove the card at the back of the monitor when you want to overwrite the content. This not only saves you time, it also gives you more freedom to install the monitor where it’s hard to reach—for example in a high place. * Toshiba FlashAir™ equipped with the requisite Sharp HTML application. Not compatible with FlashAir W-02 or earlier versions. Please consult with your local authorised Sharp dealer or representative regarding availability of the application and SD card. Operating over a LAN, SHARP Content Distributor software makes it easy to update the content to be displayed on multiple LCD monitors. Through simple and intuitive PC operation, you can schedule what content gets distributed, when it gets delivered, and which monitors show it. Take advantage of a convenient signage solution that lets you distribute content in a timely manner to multiple PN-Y556/Y496/Y436/Y326 monitors. Register up to 50 content lists, each comprising up to 30 files* of either pictures or videos. Creating and updating a customised content list is simple, thanks to intuitive operation. * A content list can comprise a group of either still images (JPEG) or videos (WMV). Set a time and day of the week for content distribution to a maximum of 20 pre-registered LCD monitors. Up to 7 schedule patterns can be registered. Easily manage individual content distribution logs that include date/time, results, and names of content lists, as well as IP addresses, names, and locations of monitors. This information can be viewed and managed on a PC screen. For more professional digital signage management, Sharp offers the option of SHARP Digital Signage Software. This software provides a wide range of signage support for content creation, scheduling, distribution, and display management. It can be used with a single standalone LCD monitor or with up to 1,000 monitors connected to a network. Sharp offers an array of solution packages to match a variety of signage needs. Mirror Display (Daisy Chain) Mode enables the same image to be displayed on a series of daisy-chained LCD monitors, for the powerful impact of visual repetition. Built-in speakers eliminate the need for external speakers and keep the PN-Y556/Y496/Y436/Y326 monitors stylishly streamlined. The speakers emit sound from both sides of the monitor, making them ideal for conveying audio information and playing location-appropriate background music. Anti-Theft Covers for USB memory device and SD card slots provide enhanced security. 24/7 Operation for use in demanding professional applications that require round-the-clock operation seven days a week. The PN-Y556/Y496/Y436/Y326 monitors incorporate a fanless architecture that serves to facilitate monitor maintenance. The fanless design maintains airflow and dissipates heat without the use of mechanical air-ventilation fans, which can attract dust and create noise. A built-in sensor detects rising temperatures inside the monitor and prompts automatic adjustment of the backlight system so that temperatures remain within operational limits. Thanks to an RS-232C interface, PN-Y556/Y496/Y436/Y326 monitors* can be easily controlled and monitored from a central location via a PC. Each monitor can be assigned an individual ID code to specify when remotely turning that monitor on or off, switching its input, or making various screen adjustments and settings. * PN-Y556/Y496/Y436/Y326 monitors can be connected together in a daisy chain configuration.